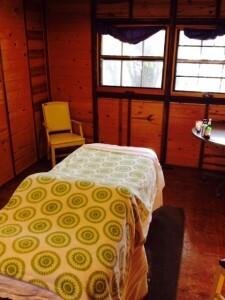 Selah’s certified therapists bring their love of massage and wellness to you, offering a unique and beneficial addition to your next event! 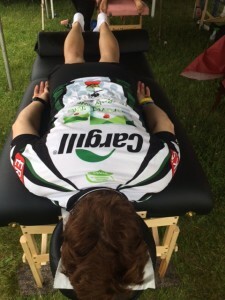 Make Selah Massage & Bodywork your trusted resource at your next event, we are happy to assist you with creating a mobile massage tailored to your needs! Selah specializes in corporate health and wellness as more companies implement on-site massage for special events, health fairs, or as a much-deserved ovation for employees with outstanding performance. Our therapeutic services are a wonderful investment to make in your staff; they will relieve tension, improve performance and productivity, and show your employees that you have a genuine concern for their well-being, helping your company attract, retain, and develop high quality personnel. Offering high quality, healing bodywork while providing a space to relax and rejuvenate for artists and the teams of professionals who work hard to make events look effortless. We truly understand the high-stress environment & unpredictable schedule that is part of stage, film & TV industry and we cater our services to transport our clients to bliss, even amidst production chaos. Creating a memorable and profoundly relaxing stay for your retreat attendees. When you hire Selah for your trade show, we wear your t-shirts and brand with you, basically becoming an extension of your marketing team; guaranteeing increased traffic to your exhibit, yielding a high return on investment; our services are extremely effective in adding value while pleasing both attendees and exhibitors. Take a look below at the wide range of spa days that we have been privileged to provide massage for and then have fun planning and creating your own treasured memories! SpaPalooza consisted of a group of 12 eight year old girls gathered for a fun birthday party. Girls are so much fun! They did each others nails, ate pizza, gave each other facials, and received 20 minute massages -many of them, for the first time. A group of women gathered to lift up their friend who was going through a very difficult time. They played games, shared their favorite dishes, and received 20 minute massages. 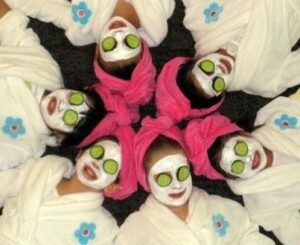 Several women gathered for a Tall Pines Day Spa retreat at a home on Lake Minnetonka. Their hosts gifted each guest with a robe and flip flops. Professional manicures and pedicures were given around the indoor pool, and hour long massage were provided in private rooms. Dinner was prepared by a professional chef, followed by a moonlit trip to Lord Fletchers in an classic wooden boat. A neighborhood in Nor’deast has a annual get together where people bring their favorite dishes to share, and receive manicures, pedicures, facials, and table massages. Their host provides the space and scheduling while each guest pays for the services that they choose to partake in. It’s not your typical neighborhood potluck, it’s a unique and pampering day that builds community. Prices start at $65 per hour. Click to request a quote for your event. A brief, stress reducing massage performed on clients who are seated in a comfortable, supportive, portable chair supplied by the practitioner. Mini massages are applied directly through clothing, and last from 10 to 30 minutes. After a short intake, your therapist will address tension primarily in the upper body (back, neck, shoulders, scalp, arms and hands) creating a sense of wellbeing throughout the whole body, leaving you feeling relaxed, refreshed, ad ready to return to the rest of your day. We cater our services to transport our clients to bliss, whether backstage, girl’s night in, even in the midst of a busy work day! 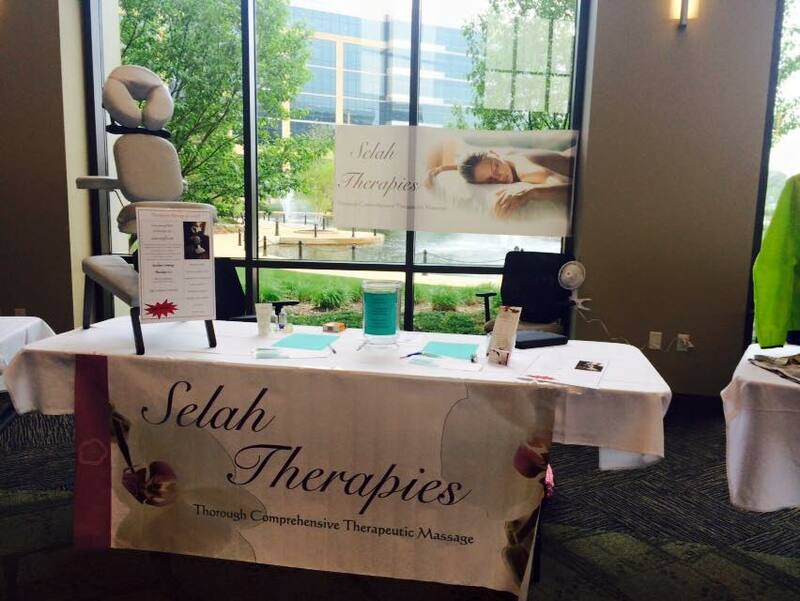 What are people saying about Selah Therapies event chair massage? I had a terribly stiff neck and shoulder for about 2 weeks to the point it was hard to turn my head. I had tried several things finally resorting to wearing a heat patch on it during the day. Amy offers massages right here at work so I thought I would give it a try and man, did she work those areas! I only had a 15 minute massage but felt much looser upon leaving and within 24 hours my neck and shoulder completely loosened up! I have recommended her to several coworkers! For the last five years, Amy has come to our Lab during Lab Week to do massages. From year to year we change what we do for the employees, breakfast one year, pizza the next…but every year we plan a day for massages.